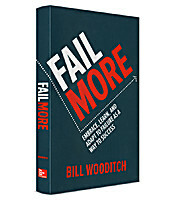 In Fail More, author Bill Wooditch provides the knowledge, insight, and tools needed to use every failure - large and small - to actually create a successful business, career, and life. By embracing failure, not just “getting past it,” you will outrun your competition, whether you’re building a startup, advancing in your career, or improving your personal life. The most underrated tool for success is failure. Now, you have a pragmatic program for turning failure today into profits and growth tomorrow. Why failure is not just acceptable but essential to success. To distinguish rational from irrational fear. To acknowledge and move beyond fear in order to reach your goals. To set goals and map out the steps to achieve them.